Tabletop Tragedies is a triptych of works by Chicago's Frank Maugeri with longtime collaborator Seth Bockley (The Last Matador, The Death and Life of Billy The Kid, and A Simple Soul). These irreverent, imaginative, and affecting works, scored by Liz Chidester, tell true stories of fate and redemption using a vast array of techniques including hand-carved wooden puppets, beastly masks, haunting music, and an epic Wild West chase scene performed on paper scrolls. (Recommended ages 12+). 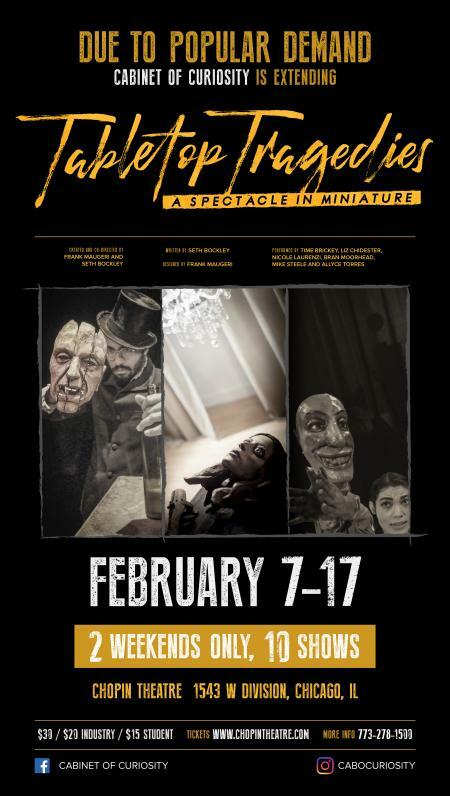 Tabletop Tragedies is a triptych of works by Chicago's Frank Maugeri with longtime collaborator Seth Bockley: The Last Matador, The Death and Life of Billy The Kid, and A Simple Soul. These irreverent, imaginative, and affecting works, scored by Liz Chidester, tell true stories of fate and redemption using an astonishing range of techniques including hand-carved wooden puppets, beastly masks, haunting music, and an epic Wild West chase scene performed on paper scrolls.